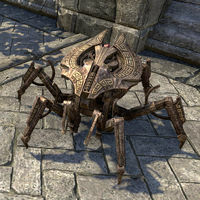 Has-Many-Legs is a Dwarven spider pet of Neetra. It can be found outside the Mages Guild tower in Skywatch next to its mistress. When first met, it is defective. This page was last modified on 16 January 2017, at 05:04.